Followed up by an interesting batch of shows from West Coast Correspondent Gary Strobl! The last weekend in July fell two days after my birthday and it also marked the beginning of my concert marathon month of August. And because it IS MY BIRTHDAY WEEKEND, Kent will indulge me with the beginning of this review. Elizabeth Silvia and Adam Landry are a guitar playing, singing, young duo who are lucky enough to be associated with The Stadium Theatre Performing Arts Center in Woonsocket, RI; and thus be chosen to open the July 28th show. This girl has a powerful voice and is strongly backed on vocals by Adam who is an instructor at the center. Starting with Joni Mitchell’s, Big Yellow Taxi and ending with Hanson’s MmmBop, they inspired the audience to clap and sing along. I became misty-eyed a few minutes in as I thought about my own mission from the last 20+ years: connecting disabled and non-disabled children to the world through the use of music. Someone helped these two on their journey, and just maybe, I have helped others. Peter and his Hermits were even higher energy than usual. Oh sure, I can attribute it to being my birthday concert, but they knew nothing of that. And it would never affect them in any way had they known. It was stifling in The Stadium Theatre … no, I mean STIFLING, HOT, HUMID! Sweat was pouring down from the audience. I can’t imagine what those stage lights were doing to Peter, Rich, Dave, Vance and Billy. I got a slight taste of it when Peter had the lights turned on the audience for a time … I think just to keep an eye on us … and we found ourselves in the middle of the Amazon Jungle , climate-wise. The audience was screaming like they did at 16. I look around and wonder where these loud teens are sitting, but no screaming teens are visible. Again I am amazed at how much energy we can muster up at these shows. I was with friends. We were having fun. The performers were having fun. One of my best Birthday weekends ever. Sunday morning finds me driving from Woonsocket to Old Saybrook, CT, to attend The Kate Theatre Performing Arts Center in an intimate setting, with a polished complexion that is so reminiscent of Katherine Hepburn herself. There is a small museum that opens one hour before each performance and is just large enough to intrigue the visitors into wanting to know more of Hepburn’s life. Everything (including the bathrooms … and this is no small feat in the concert world) is crisp and clean in a black and white motif with blinking theatre lights. I already know it is sold out and why wouldn’t it be? A shoreline theatre town with an enormous historical link to NYC and good seafood, there are probably not enough seats to handle all who run to see Peter Asher and Jeremy Clyde perform together in their first tour without Gordon or Chad. As it fills up, I see WTNH political reporter, Mark Davis, come in and Forgotten Hits reader (and producer of Strawberry Fields) Charles Rosenay arrive. I have seen Chad Stuart and Peter Asher, with an angry, frustrated Jeremy Clyde on a large screen trapped in London. I have seen Chad, Jeremy and Peter at The Fest For Beatles Fans. And now, I have seen Peter and Jeremy alone together. They think it was confusing when there was Peter and Gordon vs. Chad and Jeremy in the sixties? Well now we just never know who will come together. And COME TOGETHER THEY DID. In the lobby I was told it was two 50 minute sets, separated by a break. In the theatre I overheard that it would be two 45 minute sets with a 15 minute intermission. It turned out to be a 65 minute segment, a 15 minute intermission and an hour and 10 minute ending. WOW! Every minute packed with songs, stories, videos and pictures. I know they are off to The Chicago Fest For Beatles Fans and several other tour stops so I will not reveal the set list, dialogue or any surprises you will see when you go. Because you REALLY should go! I was able to view the 60’s world through the eyes of Peter, Jeremy and several of their friends as The British Invasion first budded and then bloomed and blossomed fully. Well, readers of Kent’s Forgotten Hits … any questions? 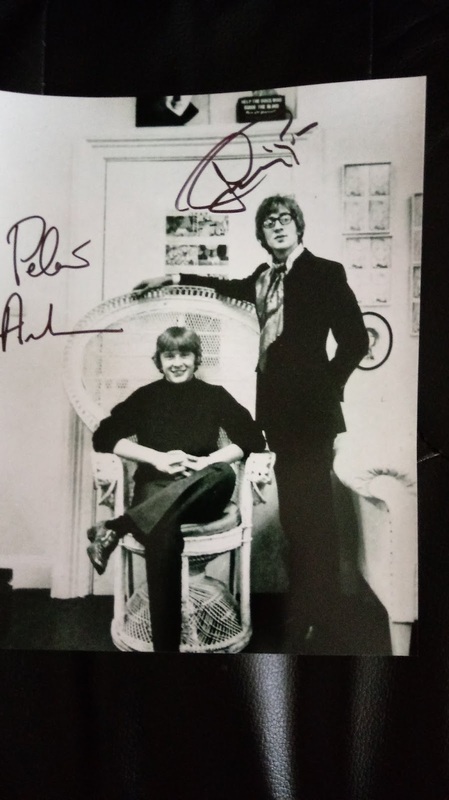 We'll be seeing Peter and Jeremy this weekend at The Fest For Beatles Fans here in Chicago ... along with our FH Buddy Billy J. Kramer, who invited us to come out as his guests. 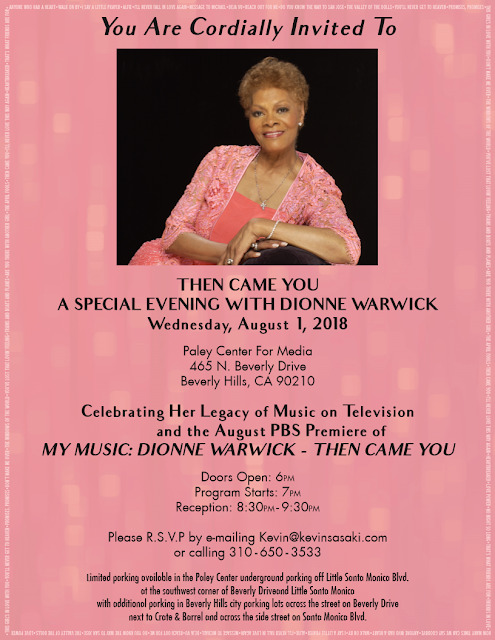 I was part of the SRO audience at the Paley Center in Beverly Hills this evening to see the premiere of the new PBS documentary My Music: Dionne Warwick - Then Came You. It was a wonderful documentary featuring rare music clips and informative and insightful interviews. These amazing music performances were shown chronologically as Dionne Warwick's illustrious career unfolded. Larry King interviewed her after the screening and she answered his questions with charm, grace and gratitude. It was indeed a magical evening of music and conversation. It is a must-see documentary for anyone who enjoys her music. Check your local listing for this very special PBS broadcast. Also, here is my pass from last week's concert with The Byrds and Marty Stuart. I went with prolific writer and good friend Harvey Kubernik on Tuesday night and then I got tickets for Henry Diltz and me the following night. Henry used to hang out with Roger and Chris at the Troubadour when Henry was playing banjo in his band The Modern Folk Quartet. 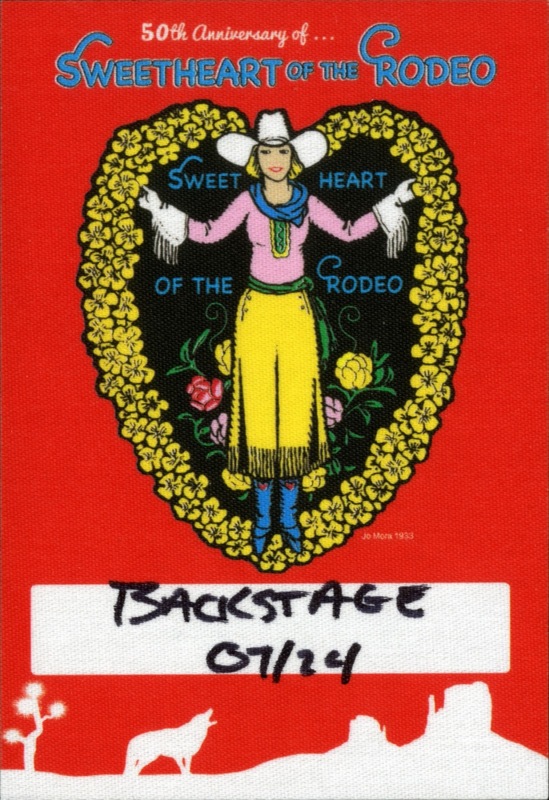 If the 50th Anniversary of Sweetheart Of The Rodeo stops in Chicago, you don't want to miss it! It was an absolutely amazing show. I am going to see Jackson Browne at the Greek Theatre on Saturday and then Jeff Lynne's ELO at the Forum on Sunday. On July 22nd, I documented an event in Laurel Canyon called Love Street Festival. Musical guests were Micky Dolenz and sister Coco, Wilson-Phillips minus Chynna (she was sick). Bijou Phillips took her place. Owen Elliot Kugell also sang. Michelle Phillips sang with all of them and the evening ended with the Robby Krieger Band. All in all, it has been a sizzling (literally) summer of music so far. Wow, these are some pretty amazing events. We’ll be seeing Jeff Lynne’s ELO on the 15th of this month … and we can’t wait! Been waiting 18 months now (well, more like thirty years if you consider the last time he toured The States!) and we cannot wait to see it. The Love Street Festival sounds incredible … if you’ve written a piece on it, I would love to run it here in Forgotten Hits so that others can enjoy it, too! Here is a nice little piece that AXS wrote up about the Love Street Festival in Laurel Canyon on July 22, 2018. I think you should share this link with your readers. It encompasses everything that happened on that hot and sunny Sunday in the hills of the mystical and legendary Laurel Canyon. "Love Street Festival is undoubtedly the best-kept secret in L.A. Somehow, in that magical space, the future, the past and the present seem to all be rolled into one. Laurel Canyon has been at the heart of so many of the songs we cherish. It’s inspired lyrical masterpieces and continues to be home to the ‘creatures’ Morrison once so poetically described. The beauty of the area remains, mostly because the elements of what used to be, still exist. The idea is not to run it over with crowds. It’s to preserve the neighborhood nestled deep in the canyon above Sunset Boulevard, just as it is."